We brought this wine to Neil’s sister Marilou’s house to enjoy it with her. The day ended up going pretty long but we still managed to celebrate WineAndCheeseFriday around 12:45 AM. During our initial swirling, we all noticed something a little different for aromas including sweet strawberry, cherry cola and some alcohol. We should probably mention that this wine did have over 15% alcohol, but maybe we were a little more sensitive considering how tired we were. The wine tasted like cherry cola and strawberries with a chocolate finish. Yum! Marilou described it as sharp, strong and pungent but she did say she liked it. When we smelled the idiazabal, Marilou said “That’ll wake you up!” Neil thought it was pungent and I simply called it salty. Neil got a little more specific with his description by identifying the barnyard aromas of hay, straw and the smell of animals in the barn. This might be too intense for some but they are all typical characteristics of a sheep cheese. Neil and I always love a funky cheese so we were happy to begin tasting. I picked up milk, salt, grass, funk and smoke in the finish. Neil noticed salt and brine. Marilou focused more on the texture than the flavor. She said the texture reminded her of muenster and it melted in her mouth. I thought the texture was chalky and dry. Before we did the pairing of rosé and idiazabal, Marilou predicted they would work well together since they were both sharp. I found it to be a delicious pairing when I picked up strawberry cheesecake aromas in the wine and flavors of strawberry yogurt and cherry cola. The cheese smelled like wax but then there was a bacon finish. Neil agreed that it was a tasty pairing since the flavor of cherry cordial appeared. 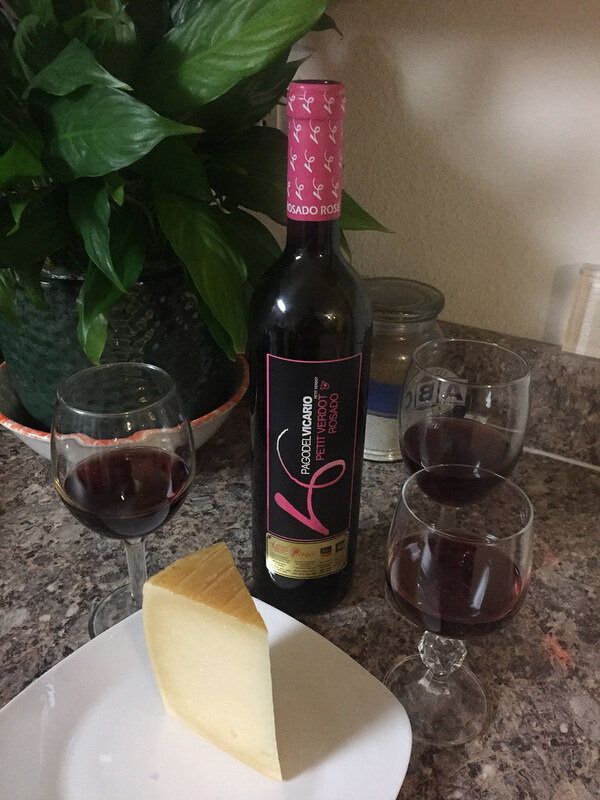 He did find the saltiness of the cheese to increase the alcohol in the wine but that just made it taste more like a cherry liqueur. So what about Marilou’s prediction, did she like it? Well, she said they did go together but there weren’t any new flavors that appeared like the time we paired the Sauvignon Blanc and Blue Cheese. She also thought the cheese became a little more dry. I’m glad we got to do a second pairing with this wine because I liked the wine a lot better this time around. And who can resist a pairing where you have things like strawberry cheesecake and bacon appear? Maybe we need to start doing more WineAndCheeseFriday pairings after midnight? Hope you all find a great rosé to celebrate with this weekend. Did you know that rosé is available using all types of red grapes? It just becomes a rosé by using a different method when the grape juice is first squeezed out of the grapes. For more information, check out this article by Wine Folly.